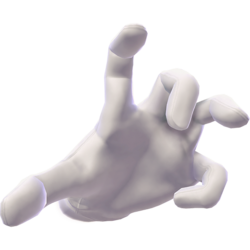 This article is about Crazy Hand's appearance in Super Smash Bros. Ultimate. For general information, see Crazy Hand. Crazy Hand returns in Super Smash Bros. Ultimate, playing a role in Adventure Mode: World of Light. Crazy Hand appears as a boss in Classic Mode. For the first time in the entire series, Crazy Hand has the ability to face in either direction (left or right), which he combines with snapping his fingers to teleport around. Also for the first time in the series since Brawl's Boss Battles, Crazy Hand no longer has a stamina HP indicator, instead having a health bar akin to bosses from Subspace Emissary and World of Light. This results in Master Hand having a separate health bar as well, meaning that they no longer share the same pool of HP as they did in Smash 4. However, he can now be stunned, which renders him immobile on the ground for about 8 seconds. The Fighters that are assigned to fight Crazy Hand in Classic Mode are Falco and Ken. Crazy Hand will also fight along with Master Hand if the intensity is 7.0 or above. Some fighters like Ice Climbers, Ryu and Diddy Kong always fight both Master Hand and Crazy Hand. Like Master Hand, Crazy Hand has received a large variety of new attacks. Big Swipe Crazy Hand makes a large swipe across the stage. Finger Bomb Crazy Hand drops a series of bombs from his fingertips. Finger Drill Crazy Hand drills down into the player. Frozen Rope Crazy Hand extends his index finger to about three times its length for a poke attack that freezes. Paralyzing Gaze Crazy Hand manifests an eye between his fingers that circles a beam of light around the stage. If the player is caught within the eye's line of sight, the light beam will briefly track their movement as it will charges up and unleashes a dark purple energy burst that stuns the player. The beam of light will circle around again if it is dodged the first time, making it hard to avoid the lock-on phase if done with improper timing. Pentaflame Crazy Hand produces five blue fireballs that circle around him. The fireballs first move outwards, then back inwards, before finally spreading outwards again. All fireballs deal aura damage. Roving Void Crazy Hand produces a black hole that proceeds to hover around the stage by itself (allowing Crazy Hand to do something else in the meantime). Being caught is a grab that leads into a meteor smash. Like Master Hand's Finger Bullet, when Crazy Hand has low health, he creates two voids. Shovel Claw Crazy Hand digs his fingers into the ground and swipes them back out as a clawing attack. The force of the swipe also creates a yellow shockwave that travels along the ground, which can be reflected. Spasm Crazy Hand drops to the ground and flops around. Snap Teleport Crazy Hand teleports by snapping his fingers. Cross Punch Crazy Hand punches across the stage, with Master Hand catching him. Dual Lasers The two hands both use Laser Nail at once, sweeping across the entire stage. Dual Sweep Crazy Hand runs his fingers across the stage like a plow, while Master Hand flies in the other direction with an uppercut. Shadow Puppet 25.8 The two hands form a canine-like shape and emit three damaging "barks" with the third being much larger than the rest. Static Discharge 33.8 The two hands rub the back of their hands to charge up with electricity, then slap the stage to release electricity that covers the whole stage platform. Zoom In 0 Master Hand and Crazy Hand create a "picture frame" (with their index fingers and thumbs), causing the screen to zoom in and flames to cover the corners in a similar fashion to Sudden Death. During this time, the blast lines are closer, and the player can get KO'd much easier. This effect is only temporary. Many Crazy Hands appears after Galeem's initial defeat, all of which led by Galeem's dark counterpart, Dharkon. He is fought three times in The Dark Realm, one guarding each of the three pathways into the subareas, and twice more during The Final Battle. Once the player manages to get the true ending's requirements, Crazy Hand and Master Hand are freed and they help the player by creating a giant rift for the latter to enter and destroy 50 false characters. Crazy Hand's freedom suggests that, like the fighters, he was captured by Dharkon before the events of World of Light and then cloned into controllable puppets. Crazy Hand's theme is mostly composed of the fourth verse of Lifelight, the main theme of Super Smash Bros. Ultimate. This is also shared with Dharkon's theme. The end of Crazy Hand's theme also has a small portion of the beginning of Master Core's theme. This page was last edited on February 25, 2019, at 21:16.